Did you get to try them out? Well either way I have a WONDERFUL giveaway for you all! 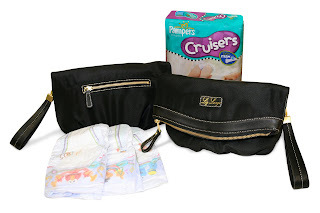 Pampers has offered to giveaway one (1) coupon for a weeks worth of diapers AND a Liz Lange designer diaper clutch! Now this giveaway is going to be a little different from all the rest. It's gonna be shorter than normal. I need to get this published and a winner chosen ASAP (you know how things happen and packages don't arrive and emails take forever - I'm SORRY!!). So with that said this giveaway will end on March 24th at Noon (12 PM) EST. To enter just leave me a comment below telling me why you would like to win the diapers and clutch. That's it. Good luck!! love to win this! My niece is having a baby in July and has one in diapers right now! This would help her out a lot! Thanks for the chance! We are going to be fostering a little boy and his sister very soon. The little boy is still in diapers and we would love to win this for him! We go through so many diapers. Please enter me to win!